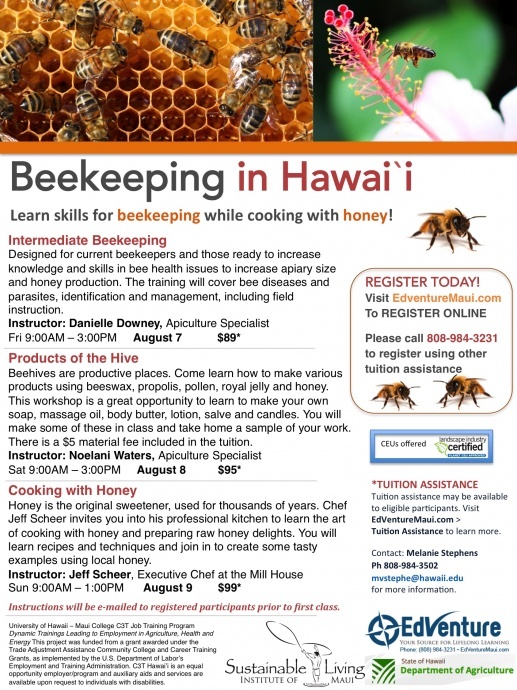 The University of Hawai‘i Maui College EdVenture program and the Sustainable Living Institute of Maui are offering a beekeeping series in partnership with the Maui Master Gardener Program at the College of Tropical Agriculture and Human Resources and the Cooperative Extension. The three-day series will be held from Feb. 5 to 7, 2015. Whether you want to try one hive, or plan to start an apiary for small-scale honey production, this series has something for everyone. Beekeepers on Maui have advantages. Because temperatures are moderate all year, honey can be harvested several times a year. There are also no varroa mites on Maui. These debilitating parasites are, however, present on O‘ahu and Hawai‘i Island. Maui also boasts an abundance of flowers from which bees extract nectar and pollen. 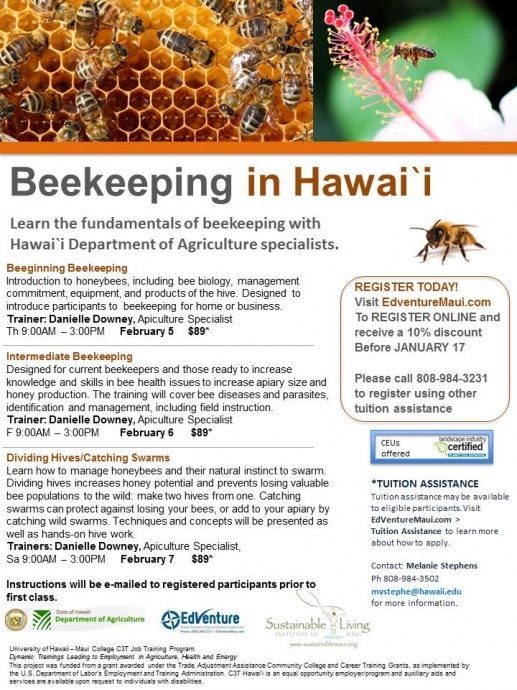 Danielle Downey, apiculture specialist for the Hawai‘i Department of Agriculture, will teach the series of three classes on the UHMC campus from 9 a.m. to 3 p.m. Hands-on work with the hives is included. 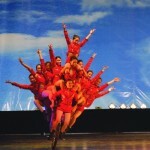 The classes are limited to 15 participants each. “Beeginning Beekeeping” on Feb. 5 will offer an introduction focusing on bee biology, hive equipment and what is required to care for bees. 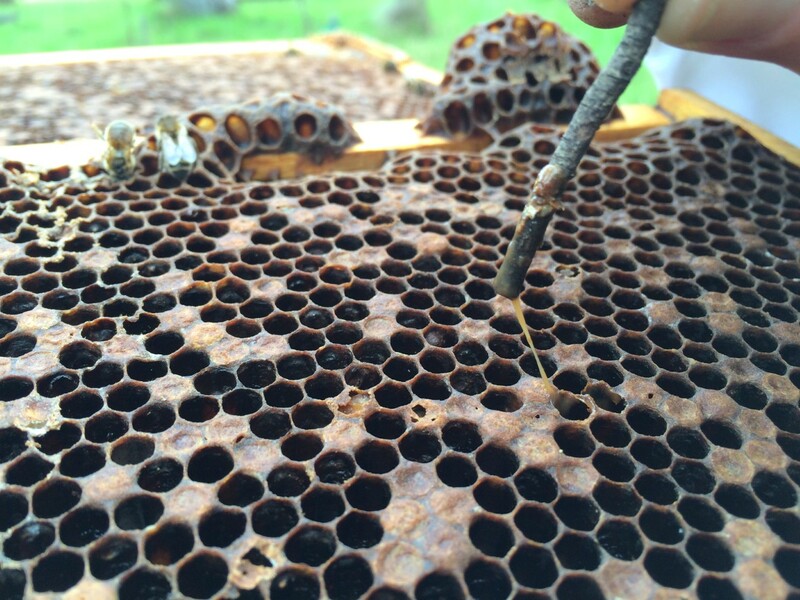 “Intermediate Beekeeping” on Feb. 6 is focused on honeybee health issues. The class will cover identifying and managing bee diseases and parasites, and keeping hives healthy for greater honey production. “Dividing Hives and Catching Swarms” on Feb. 7 is a new offering. It will focus on managing honeybee’s natural instinct to swarm. Dividing hives increases honey potential and prevents loss of valuable bee populations to the wild. Hives for these classes in the newly established apiary in the Maui Master Gardener garden have been donated by Hawai‘i Department of Agriculture and UH Mānoa Honeybee Project. 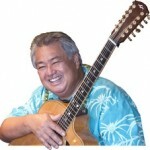 Register by calling EdVenture at 984-3231, or online for at edventuremaui.com. Tuition assistance may be available for eligible applicants. Email mvstephe@hawaii.edu for more information. According to numerous news sources, backyard beekeeping is on the rise. 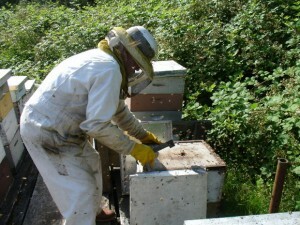 Although beekeeping can be easily taught, it requires years of experience to master.